Chapter 1. 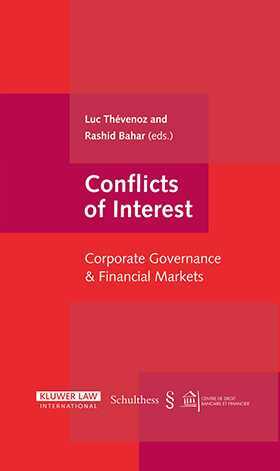 Conflicts of Interest: Disclosure, Incentives, and the Market. Chapter 2. Structure of Executive Compensation and Conflicts of Interest – Legal Constraints and Practical Recommendations under Swiss Law. Chapter 3. Executive Compensation: Is Disclosure Enough?. Chapter 4. Executive Compensation and Analyst Guidance: The Link between CEO Pay and Expectations Management. Chapter 5. Investment Research: How to Solve Conflicts of Interest More Efficiently. Chapter 6. Do Conflicts of Interest Affect Analysts’ Forecasts and Recommendations? A Survey. Chapter 7. Regulation of Financial Analysts: An Illustration of the Current Trends in Financial Market Law. Chapter 8. Conflicts of Interest in Research: Independence of Financial Analysts – The Costs and Benefits of Regulation. Chapter 9. Conflicts of Interest, Especially in Asset Management. Chapter 10. Conflicts of Interest in Institutional Asset Management: Is the EU Regulatory Approach Adequate? Chapter 11. Conflicts of Interest in the Distribution of Investment Funds. Chapter 12. United States Manual Fund Investors, Their Managers and Distributors.